Hello, my name is Andy Hayes and I collect rubbish. Not just any old rubbish; that would be weird. I’m merely strange. I collect handwritten scraps of paper that have been discarded and abandoned on London’s streets. I’ve been doing this for over three years now. 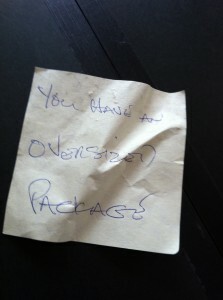 The latest one, ‘You have an oversized package’, is probably my favourite. Yes, I know what you’re thinking… But I’m a boy. I can’t help myself. My original intention was to write stories based around each scrap. They would form the pieces of a jigsaw puzzle which, when completed, would turn into a book called Throwaway Lines. I built up my collection to well over forty scraps. Then nothing happened. Not a single word was written and eventually I decided I needed some help. I met John Simmons for lunch at The Museum of London. John is very generous with his time, despite being very much in demand for everything associated with words. He liked the idea and pitched it to the board of 26, the writers’ collective. The author Elise Valmorbida offered to help too, and coined the term ‘litterature’ for stories created from rubbish. We launched the project at Wordstock last year, and 26 writers wrote 26 short stories in 26 days. Each based around a handwritten scrap. Elise and John were editors, alongside two other established writers, Nick Parker and Neil Baker. You’ll find all the stories in this section of the site. And eight more from a second collection that ran earlier this year too. And now it’s even more exciting. The Free Word Centre in Clerkenwell is hosting a show of Throwaway Art. This will run from 29 October to 26 November 2012. You’ll get to see the original scraps, all framed in an unusual way. And not just because we can’t afford any decent frames. Each scrap, or story, will determine its own frame and become an intrinsic part of the artwork. You’ll also be able to read the stories via the wonders of modern technology. And maybe, just maybe, in good old-fashioned book form too. I hope you can come. In the meantime, if anyone wants to suggest a frame or write about their oversized package, just drop me a line at andyinfinity@hotmail.com – thank you very much indeed. Throw Away Lines is the latest project from 26, the writers’ collective. 26 of our writers are going to create 26 stories in 26 days. 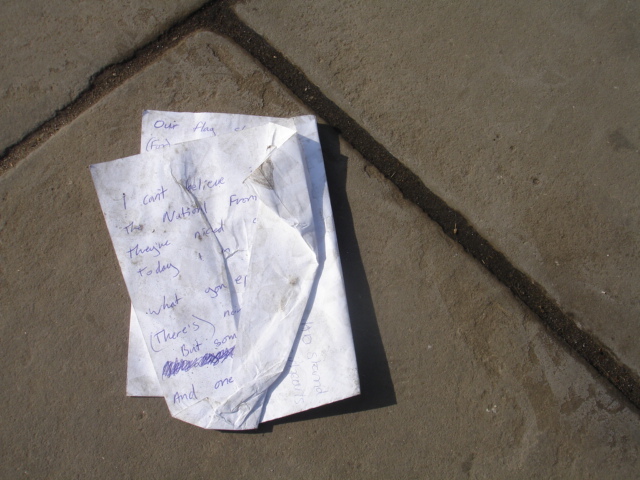 Each story will be based on rain-swept, wind-strewn, handwritten notes found on London’s streets over the past couple of years. 26er Andy Hayes has been walking to work in Clerkenwell from Waterloo ever since the 7/7 bombings. Andy is a tidy and curious chap. He doesn’t like litter and he notices flotsam and jetsam wherever he goes. Once on Blackfriars Bridge he paused to take a photo of a discarded Nero coffee cup and noticed a scruffy handwritten note a few yards away. He bent down and picked it up, it was a heartfelt rant against racism. It had a muddy footprint on it, as though it had been stamped on by a Nazi jackboot. He kept the letter and the seed of an idea took root in his head and started to grow. What if he looked out for other discarded hand-written notes, or ‘throw away lines’? He could keep and collect them, and, who knows, one day they might come in handy as material for his own writing. He took the muddy letter home and placed it carefully in a clean plastic wallet. Then washed his hands. Two years later, he had at least 26 of these throw away lines. One, found outside an English language school, stated a brazen promise to, ‘…only do the pass criteria’. There was a letter from a mother jetting off to foreign climes, leaving her daughter Anya with her Nan. Another gave permission for Morgan to be allowed ‘off the premises for boxing’. There was a beautiful song complete with chord changes and a small post-it saying simply, ‘Have a lovely trip x’. Then, nothing happened. He kept on collecting but all the stories remained unwritten. He had an idea, to share the storytelling with other 26ers. He pitched it to John Simmons over coffee and a sticky bun at the Museum of London. He liked it, the 26 board did too. Elise Valmorbida offered to help. Now, each scrap is going to be the starting point for a small story: a story about an abandoned story if you like. At Wordstock, a festival of words at the Free Word centre in Clerkenwell, 26 writers were matched up with 26 stories, all drawn out of two white-spotted bins, one pink, one blue. Now each story, up to 1,500 words, will be posted here initially over 26 consecutive days from mid-November. Then, we plan an exhibition, maybe even a book – definitely a t-shirt. 5 Responses to What’s it all about? I love this idea – and somehow it seems even more pertinent to tell the stories now while people are still writing things down on paper. At some point in the future, the lines won’t be throw-away because they’ll be embedded in someone’s iphone etc and we’ll have lost the possibility to imagine someone else’s dream. Wonderful idea, loved the first couple of stories and plan to read more. Nice to think that it’ll help to remove litter from London’s streets too. love it! will certainly be at the exhibition. My delight is signs like – ‘This window is alarmed’ – well, I get scared sometimes too. As for stopping children crossing – child protection officers were swiftly on the spot.